At an inn in the Berkshire Mountains of western Massachusetts, seven former schoolmates gather for a wedding. Bridget is marrying Bill--who was her lover at Kidd Academy years ago--after a chance encounter has brought them together again. Nora, the owner of the inn, has agreed to host this reunion of her old friends a group that was once close as only high school friends can be but was scattered by a tragedy that occurred just before graduation. At an inn in the Berkshire Mountains, seven former schoolmates gather to celebrate a wedding--a reunion that becomes the occasion of astonishing revelations as the friends collectively recall a long-ago night that indelibly marked each of their lives. Written with the fluent narrative artistry that distinguishes all of Anita Shreve's bestselling novels, A Wedding in December acutely probes the mysteries of the human heart and the endless allure of paths not taken. 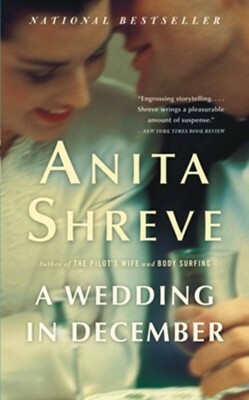 Anita Shreve is the acclaimed author of 14 previous novels, including Testimony; The Pilot's Wife, which was a selection of Oprah's Book Club; and The Weight of Water, which was a finalist for England's Orange prize. She lives in Massachusetts. I'm the author/artist and I want to review A Wedding in December: A Novel - eBook.